1 K None No Power Seat 1 K is a standard First Class suite. 10 A None No Power Seat 10 A is a standard Business Class seat whose proximity to the bulkhead and galleys may be bothersome. 10 C None No Power Seat 10 C is a standard Business Class seat whose proximity to the bulkhead and galleys may be bothersome. 10 H None No Power Seat 10 H is a standard Business Class seat whose proximity to the bulkhead and galleys may be bothersome. 10 K None No Power Seat 10 K is a standard Business Class seat whose proximity to the bulkhead and galleys may be bothersome. 16 A None No Power Seat 16 A is a standard Economy Class seat whose proximity to the bulkhead may restrict legroom. 16 B None No Power Seat 16 B is a standard Economy Class seat whose proximity to the bulkhead may restrict legroom. 16 C None No Power Seat 16 C is a standard Economy Class seat whose proximity to the bulkhead may restrict legroom. 16 H None No Power Seat 16 H is a standard Economy Class seat whose proximity to the bulkhead may restrict legroom. 16 J None No Power Seat 16 J is a standard Economy Class seat whose proximity to the bulkhead may restrict legroom. 16 K None No Power Seat 16 K is a standard Economy Class seat whose proximity to the bulkhead may restrict legroom. 18 D None No Power Seat 18 D is a standard Economy Class seat whose proximity to the bulkhead may restrict legroom. 18 E None No Power Seat 18 E is a standard Economy Class seat whose proximity to the bulkhead may restrict legroom. 18 F None No Power Seat 18 F is a standard Economy Class seat whose proximity to the bulkhead may restrict legroom. 18 G None No Power Seat 18 G is a standard Economy Class seat whose proximity to the bulkhead may restrict legroom. 20 A None No Power Seat 20 A is a standard Economy Class seat whose proximity to the lavatories may be bothersome. This seat has limited recline and is also missing a window. 20 B None No Power Seat 20 B is a standard Economy Class seat whose proximity to the lavatories may be bothersome. This seat also has limited recline. 20 C None No Power Seat 20 C is a standard Economy Class seat whose proximity to the lavatories may be bothersome. This seat also has limited recline. 20 D None No Power Seat 20 D is a standard Economy Class seat whose proximity to the lavatories may be bothersome. This seat also has limited recline. 20 E None No Power Seat 20 E is a standard Economy Class seat whose proximity to the lavatories may be bothersome. This seat also has limited recline. 20 F None No Power Seat 20 F is a standard Economy Class seat whose proximity to the lavatories may be bothersome. This seat also has limited recline. 20 G None No Power Seat 20 G is a standard Economy Class seat whose proximity to the lavatories may be bothersome. This seat also has limited recline. 20 H None No Power Seat 20 H is a standard Economy Class seat whose proximity to the lavatories may be bothersome. This seat also has limited recline. 20 J None No Power Seat 20 J is a standard Economy Class seat whose proximity to the lavatories may be bothersome. This seat also has limited recline. 20 K None No Power Seat 20 K is a standard Economy Class seat whose proximity to the lavatories may be bothersome. This seat has limited recline and is also missing a window. 21 A None No Power Seat 21 A is a standard Premium Economy Class seat that has some extra legroom due to the exit row however, the proximity to the lavatories may be bothersome. 21 C None No Power Seat 21 C is a standard Premium Economy Class seat that has some extra legroom due to the exit row however, the proximity to the lavatories may be bothersome. 21 H None No Power Seat 21 H is a standard Premium Economy Class seat that has some extra legroom due to the exit row however, the proximity to the lavatories may be bothersome. 21 K None No Power Seat 21 K is a standard Premium Economy Class seat that has some extra legroom due to the exit row however, the proximity to the lavatories may be bothersome. 22 D None No Power Seat 22 D is a standard Premium Economy Class seat that has slightly restricted legroom due to the position of the bulkhead. The proximity to the lavatories may be bothersome. 22 E None No Power Seat 22 E is a standard Premium Economy Class seat that has slightly restricted legroom due to the position of the bulkhead. The proximity to the lavatories may be bothersome. 22 F None No Power Seat 22 F is a standard Premium Economy Class seat that has slightly restricted legroom due to the position of the bulkhead. The proximity to the lavatories may be bothersome. 22 G None No Power Seat 22 G is a standard Premium Economy Class seat that has slightly restricted legroom due to the position of the bulkhead. The proximity to the lavatories may be bothersome. 23 F None No Power Seat 23 F is a standard Premium Economy Class seat. 24 F None No Power Seat 24 F is a standard Premium Economy Class seat. 27 A None No Power Seat 27 A is a standard Economy Class seat that has extra legroom however, the tray table is in the armrest, making the armrest immovable and slightly reducing seat width. 27 B None No Power Seat 27 B is a standard Economy Class seat that has extra legroom however, the tray table is in the armrest, making the armrest immovable and slightly reducing seat width. 27 C None No Power Seat 27 C is a standard Economy Class seat that has extra legroom however, the tray table is in the armrest, making the armrest immovable and slightly reducing seat width. 27 D None No Power Seat 27 D is a standard Economy Class seat that has extra legroom however, the tray table is in the armrest, making the armrest immovable and slightly reducing seat width. 27 E None No Power Seat 27 E is a standard Economy Class seat that has extra legroom however, the tray table is in the armrest, making the armrest immovable and slightly reducing seat width. 27 F None No Power Seat 27 F is a standard Economy Class seat that has extra legroom however, the tray table is in the armrest, making the armrest immovable and slightly reducing seat width. 27 G None No Power Seat 27 G is a standard Economy Class seat that has extra legroom however, the tray table is in the armrest, making the armrest immovable and slightly reducing seat width. 27 H None No Power Seat 27 H is a standard Economy Class seat that has extra legroom however, the tray table is in the armrest, making the armrest immovable and slightly reducing seat width. 27 J None No Power Seat 27 J is a standard Economy Class seat that has extra legroom however, the tray table is in the armrest, making the armrest immovable and slightly reducing seat width. 27 K None No Power Seat 27 K is a standard Economy Class seat that has extra legroom however, the tray table is in the armrest, making the armrest immovable and slightly reducing seat width. 3 D None No Power Seat 3 D is a standard First Class suite. 3 G None No Power Seat 3 G is a standard First Class suite. 32 D None No Power Seat 32 D is a standard Economy Class seat with limited recline. The proximity to the galley may be bothersome. 32 E None No Power Seat 32 E is a standard Economy Class seat with limited recline. The proximity to the galley may be bothersome. 32 F None No Power Seat 32 F is a standard Economy Class seat with limited recline. The proximity to the galley may be bothersome. 32 G None No Power Seat 32 G is a standard Economy Class seat with limited recline. The proximity to the galley may be bothersome. 33 A None No Power Seat 33 A is a standard Economy Class seat that may have limited recline. The proximity to the galley may be bothersome. 33 B None No Power Seat 33 B is a standard Economy Class seat that may have limited recline. The proximity to the galley may be bothersome. 33 C None No Power Seat 33 C is a standard Economy Class seat that may have limited recline. The proximity to the galley may be bothersome. 33 H None No Power Seat 33 H is a standard Economy Class seat that may have limited recline. The proximity to the galley may be bothersome. 33 J None No Power Seat 33 J is a standard Economy Class seat that may have limited recline. The proximity to the galley may be bothersome. 33 K None No Power Seat 33 K is a standard Economy Class seat that may have limited recline. The proximity to the galley may be bothersome. 34 A None No Power Seat 34 A is a standard Economy Class seat whose proximity to the galleys may be bothersome. 34 B None No Power Seat 34 B is a standard Economy Class seat whose proximity to the galleys may be bothersome. 34 C None No Power Seat 34 C is a standard Economy Class seat whose proximity to the galleys may be bothersome. 34 D None No Power Seat 34 D is a standard Economy Class seat whose proximity to the galleys may be bothersome. 34 E None No Power Seat 34 E is a standard Economy Class seat whose proximity to the galleys may be bothersome. 34 F None No Power Seat 34 F is a standard Economy Class seat whose proximity to the galleys may be bothersome. 34 G None No Power Seat 34 G is a standard Economy Class seat whose proximity to the galleys may be bothersome. 34 H None No Power Seat 34 H is a standard Economy Class seat whose proximity to the galleys may be bothersome. 34 J None No Power Seat 34 J is a standard Economy Class seat whose proximity to the galleys may be bothersome. 34 K None No Power Seat 34 K is a standard Economy Class seat whose proximity to the galleys may be bothersome. 4 A None No Power Seat 4 A is a standard Business Class seat whose proximity to the bulkhead, galley, and lavatories may be bothersome. 4 C None No Power Seat 4 C is a standard Business Class seat whose proximity to the bulkhead, galley, and lavatories may be bothersome. 4 D None No Power Seat 4 D is a standard Business Class seat whose proximity to the bulkhead, galley, and lavatories may be bothersome. 4 G None No Power Seat 4 G is a standard Business Class seat whose proximity to the bulkhead, galley, and lavatories may be bothersome. 4 H None No Power Seat 4 H is a standard Business Class seat whose proximity to the bulkhead, galley, and lavatories may be bothersome. 4 K None No Power Seat 4 K is a standard Business Class seat whose proximity to the bulkhead, galley, and lavatories may be bothersome. 47 B None No Power Seat 47 B is a standard Economy Class seat in the last row of the aircraft that may have limited recline. The proximity to the lavatories may be bothersome. 47 C None No Power Seat 47 C is a standard Economy Class seat in the last row of the aircraft that may have limited recline. The proximity to the lavatories may be bothersome. 47 H None No Power Seat 47 H is a standard Economy Class seat in the last row of the aircraft that may have limited recline. The proximity to the lavatories may be bothersome. 47 J None No Power Seat 47 J is a standard Economy Class seat in the last row of the aircraft that may have limited recline. The proximity to the lavatories may be bothersome. 48 D None No Power Seat 48 D is a standard Economy Class seat whose proximity to the lavatories may be bothersome. 48 G None No Power Seat 48 G is a standard Economy Class seat whose proximity to the lavatories may be bothersome. 49 D None No Power Seat 49 D is a standard Economy Class seat in the last row of the aircraft that may have limited recline. The proximity to the lavatories may be bothersome. 49 E None No Power Seat 49 E is a standard Economy Class seat in the last row of the aircraft that may have limited recline. The proximity to the lavatories may be bothersome. 49 F None No Power Seat 49 F is a standard Economy Class seat in the last row of the aircraft that may have limited recline. The proximity to the lavatories may be bothersome. 49 G None No Power Seat 49 G is a standard Economy Class seat in the last row of the aircraft that may have limited recline. The proximity to the lavatories may be bothersome. 86 A None No Power Seat 86 A is a standard Business Class seat. 86 C None No Power Seat 86 C is a standard Business Class seat. 86 H None No Power Seat 86 H is a standard Business Class seat. 87 A None No Power Seat 87 A is a standard Business Class seat. 87 C None No Power Seat 87 C is a standard Business Class seat. 87 H None No Power Seat 87 H is a standard Business Class seat. 87 K None No Power Seat 87 K is a standard Business Class seat. 88 A None No Power Seat 88 A is a standard Business Class seat. 88 C None No Power Seat 88 C is a standard Business Class seat. 88 H None No Power Seat 88 H is a standard Business Class seat whose proximity to the lavatory and galleys may be bothersome. 88 K None No Power Seat 88 K is a standard Business Class seat. 9 A None No Power Seat 9 A is a standard Business Class seat whose proximity to the lavatories may be bothersome. 9 C None No Power Seat 9 C is a standard Business Class seat whose proximity to the lavatories may be bothersome. 9 D None No Power Seat 9 D is a standard Business Class seat whose proximity to the lavatories may be bothersome. 9 G None No Power Seat 9 G is a standard Business Class seat whose proximity to the lavatories may be bothersome. 9 H None No Power Seat 9 H is a standard Business Class seat whose proximity to the lavatories may be bothersome. 9 K None No Power Seat 9 K is a standard Business Class seat whose proximity to the lavatories may be bothersome. This 747-800 is the newest aircraft type in the long-haul fleet for Lufthansa. 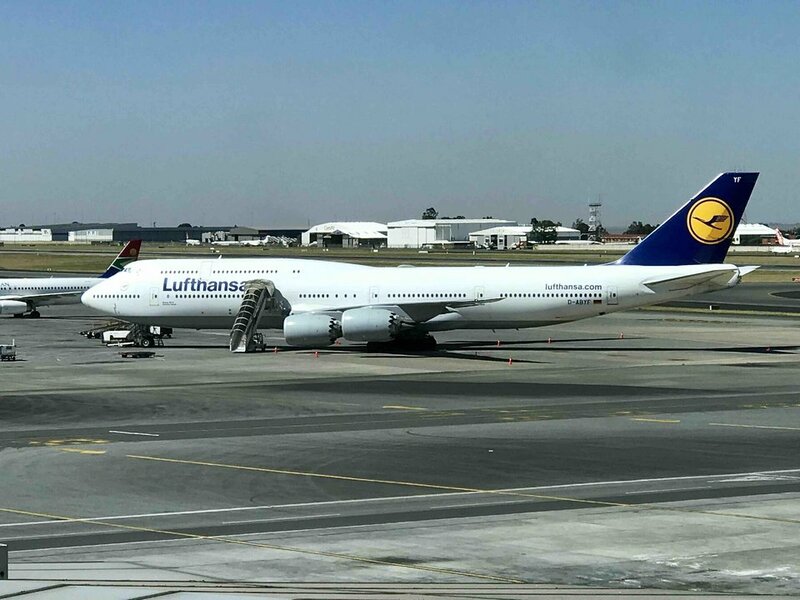 Lufthansa is the launch airline for the 747-800 which is 5.6 meters longer than its predecessor, making it the longest passenger aircraft in the world. This aircraft accommodates 364 passengers in a four class configuration. First Class features Lufthansa's new First Class suite, now situated on the main deck and limited to 8 passengers; Business Class features Lufthansa's new flat bed business class seat in 2-2-2 configuration on the main deck and 2-2 on the upper deck; Economy class features individual television monitors. 18H is a very good seat for standard economy. Nobody annoying at all and next to the gate if you are in a hurry for connecting flight. LAVARATORIES - go to the ones at the end of the plane. There are 4, normally less used and very clean. As emergency exit space is used for storage of carts, and for handout of meals there is extra noise. Magazine storage in shelf right ahead of seats creates some traffic. Row 21, seats A, C, H, K can be really annoying if there is a line in front of the wash room. There is no barrier, some waiting people there even tread on the feet of the people sitting in row 21. I would mark those seats as red, not yellow. Row 27 ist perfect for extra leg room and the front row is very far away (my hight 6,7). Also the back of the seat is flexible an you can lean backwards. No serving or dishes, bathroom area near by. Legroom is OK if you're taller. Due to the room on the side of the chairs you can stretch your legs here and put down stuff. However, this becomes hard when the person in front of you reclines his/her seat making the required slight turn to put your feet on the side pretty hard. 85C on LH 499 MEX - FRA. What I really love about this seat is the privacy on the upper deck of the super silent 747-8. It feels like being on a huge private jet with a few other people around. Being 1,94 tall the seat is not really comfortable for sleeping as too short but one gets through the night ok. In sitting or chilled position it's fine. I got lucky and the neighbor seat stayed free so I had tons of storage space for myself and for sleeping just extended my legs to the neighbors footrest. If you have a neighbor though it'd be bothering in terms of privacy. The food was really good. Inflight entertainment is good. The flight was on time. My only complaint is the attitude of the flight attendants. Fairly arrogant from the beginning and not very attentive as too caught up being fabulous. 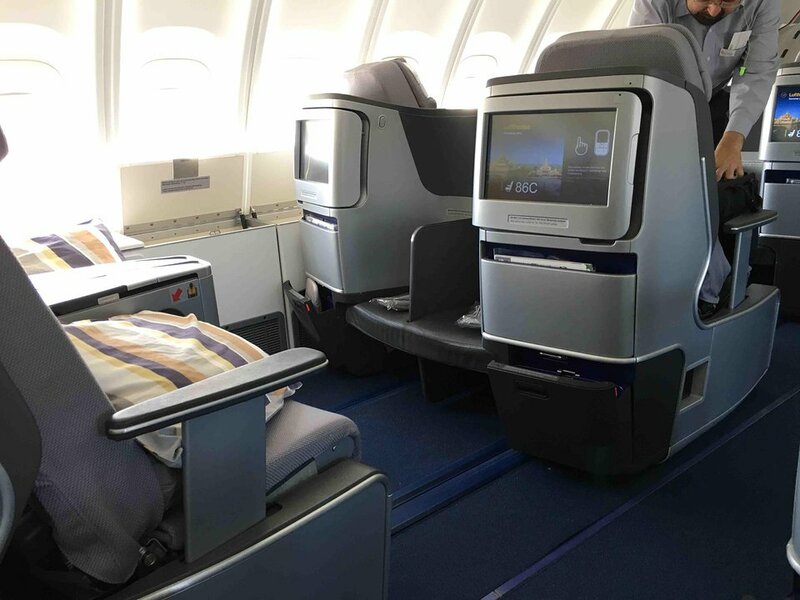 Which is a shame, cause all in all, LH business class in the 747-8, especially in the upper deck, is a great product. FRA - ORD. A lot of people complain about the seat's lack of privacy which is true - you are out in the open. In my opinion, the spaciousness of the cabin and seats make up for that lack of privacy. I am 6'6" and not as thing as I used to be. These seats are very roomy and it is extremely easy to find a comfortable sleeping position. The center seats have the best storage space as well. Lufthansa cabins tend to be too hot to get a good night's sleep on an overnight flight but they are fine for a day flight. Honestly, I prefer these seats to the new United Polaris seats. Frankfurt to Chicago O'Hare. The TV screen boxes for the row in front (18D-G) are positioned on the floor resulting in much-reduced leg room for everyone in seats 19D-G. Aside from that, a classic Lufthansa experience. GREAT! The service was the best I have ever experienced. Food was great. Movie selections very good. I cannot say anything bad. I really liked this seat when I was flying from BOS-BCN (VIA FRA). It was really comfortable and all the people were nice but I wish Lufthansa had fully flat beds because when I flew I had to put my feet on the compartment. It felt like an Angle Lie Flat! A great business class seat! This whole row has the overhead storage compartments almost filled with aircraft-related materials....almost no available storage for passenger's carry-ons...a caution. Extremely tight in all directions. In a word, sardine can accommodation. In addition, the aft section of the plane is subject to considerable yaw. Very uncomfortable. All that section should be, at best, yellow. Just completed the Flight from JFK to Frankfurt in this seat with extra legroom for extra money... horrible idea as I am long and not skinny. This seat is quite a bit more narrow than a regular economy class on the 748 and much narrower than regular economy on the A380. Due to the fixed armrests containing trays an monitors that means bout 4-5 inches less width and the power outlet under the seat and the aisle switching from premium economy to economy it is right in the path of the cabin crew with their trollies means it doesn't have full extra legroom. It has only about 60% of the width of the legroom usable at all. I got hit in the shoulder with the drinks trolly as it protrudes out one side slightly and I am too tall to fit my shoulder under that latch and the crew slammed the filled food trolly into the front of my seat where the aisle jumps from two seat premium economy to three seat economy on the outside. If that tray hits your knee full on thats a trip to the hospital at least. This seat should not cost a premium of 75 it should be half price! Next time either my secret great seats on the A380 or premium economy on the 748. June 2018, lots of kids were in business class and they were noisy. We were in the upper deck and took the advice to be in the back of the upper deck because it was less noisy. I think the front of the upper deck may have been better and you get BOSE head sets to block out noise. The seats are awkwardly pointing in and the tv screen and is below average quality. The screens do not stay put all the time and the slanting of the seat is awkward. This was my worst business class experience so far. The flight attendant was blocking everyone upstairs coming down with his armand favoring first class cabin first, then the following side of business class downstairs. Row 27 has great leg room. The aisle is turning slightly due to the PE seats in front. People passing by will bump into the person seated at 27H. Next time I will choose 27D or G. Paid 77euro for 9 hours night flight BLR-FRA. Worth the money. 82HK are great seats. Being on both the upper deck and near to the bulkhead mean they feel more private than the rest of Business Class, particularly compared to the lower deck. Additionally, I feel all A and K seats on the upper deck should be given a mixed (very good and average) review. These seats have extra storage bins under the windows, but do require climbing over the passenger in the aisle seat (C or H) if they are in lie-flat bed mode. This seat is a preferred seat but in my opinion the seats up to row 84-85 are way noisier than the seats towards the back of the upper deck. Also, you are normally first off the plane when you sit in the back of the upper deck. So that is my choice. Flight from Frankfort to Newark. Seat 16H is awesome and no extra charge up from Economy. First seat behind business class, extra legroom. Feet can go under curtain and into business class . First seat served. Individual seat monitor along armrest. When selecting seat, choose this one!! Row is 2-4-2 however 45B,C seats are slightly left of the seats in front in row 46. The tray tables that are in the seat back drops off center to the right so a bit awkward as it rests on right armrest. Also slightly less pitch than the middle seats in row 45. Appears to be approx 1/2 to 1. Must be the coldest seat in plane as you sit in a horrible drought - I get freezed during my 10h flight from JoBurg to Frankfurt. Seat is very narrow. Plenty of legroom is a plus. Wouldnt pay 100 EUR extra to reservate this seat again. FRA - HND Very good for couples to have a private space that extends across the cabin and no traffic. Elegant open feeling with the nice touch of a rose on each window sill and power blinds for the windows. comfortable bed that for myself at 5'11" was more than required in length and a nice width. Everything a person could want in both the Lufthansa hard and soft product to me. Same seats a week later on the way back to Germany. For couples that want to be a little closer and chat the row 3 center seats work well. For couples to both enjoy the view and privacy, 1A and 1K work well. One of the worst seats in the plane. Middle seat with almost no recline and next to the galley. Being next to the galley however means you are always served last (and not always all options are still available). These upstairs business class seats are great. They are comfortable, the selection of video includes first-run movies (I watched two 2018 Oscar winners!) and having three flight attendants for 32 passengers led to attentive service. The angling of the seats is a bit odd, but it's easy to adapt. Fuselage starts to narrow near the window, this seat is noticeably narrower than the seat in front of it (43K). However, there is no seat directly behind you so you can recline during meal service without interrupting anyone. Not a bad seat, but caution is advised. All row 34 on this flight was an "infant" row, with room for 4 bassinets in total (one left side, one right side, two middle). Good legroom (I am not very tall) but no support for feet. IFE system and tray table are in the armrest. Any luggage must be stored for take off and landing. The plane is rather old. Very bad seat, Besides being squeezed between seat E and G you cannnot stretch your legs because of the metal leg of the front seat and a metal box that is placed underneath the seat in front of you. It is a shame that LUfthansa charges you the same ticket price for this seat. It should be less! Very uncomfortable!!! 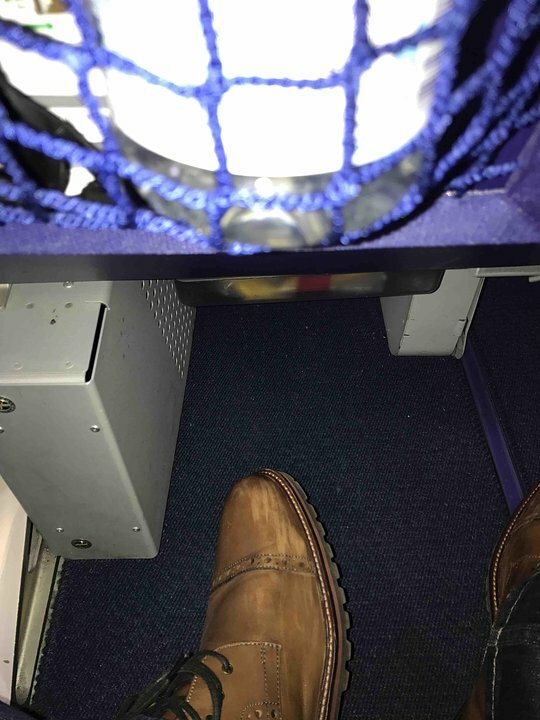 Seat has advantages mentioned by others, but unlike its counterpart on the other side of the plane, the overhead bin is devoted to a medical supply box, so you have to find another bin for your carry-on. If 1K is empty (which it was on my flight), then 1A is the way to go with a private jet feel for a 10 hour flight. Otherwise, take 2A or 2K if privacy is important. very nice First Class. Very very quiet cabin due the special carpet and special dividers between First Class and other plane. Significantly reduced leg-room due to a device installed under seat in previous row. In my opinion this seat is one of the best in the upper cabin. For long-haul flights it is best to select the upper deck for its small jet feeling. This, as all upper-deck window seats have plenty of storage space on the side. Could get a bit chilly as in all the window seats happens. I think 1A/1K should be green. Also noted that they are great seats for couples and provide the most privacy on the plane. Infant bassinets are available at seats 34C, 34D, 34G and 34H. They can only be reserved by calling Lufthansa in advance or when checking in at the airport. I'm 199 m, but this PE seat gives me plenty of legroom. Not as much as in business, but PE should be condsidered an upgrade from economy. Personally I think the recline is too much. When the person in front of you fully reclines, the personal space (=face distance) gets very small. Proximity to lavatories still bothersome (smelly...) Permanent A/C current from atop - bring warm clothes and a scarf! Flew from FRA to BOS. Seat 18 A is located in the first part of the Econmy Cabin. It can be not chosen in advance but only during Check-In or by preferred customers only. Therefore in this part of the cabin several seats were not occupied while the rest of the cabin was full. The Seat is not bad, there is enough legroom because there is no box of the IFE under Seat 17A. Service is unattentive, food is below average. I was seated in the first row of Economy, the centre section right behind the bulkhead to Business. I can't recommend this seat, as there really isn't that much extra legroom and the already narrow economy seat is even narrower on account of the IFE and traytable in the armrest. Mediocre service and confort overall. I would avoid this aircraft; the A330/340 I've flown on with LH are quieter with better IFE. IAD to FRA in Business Class seat 6H (side aisle, lower deck). I also tried 7G in a middle pair. The middle seat pairs are set at a much greater angle to each other -and set farther from each other- than the side seat pairs. That results in a bed length that is meaningfully longer (due to the angle). The middle seat pairs also offer significantly more foot room, due to the larger console in the center. I am 191cm/6'3" and 6H was not quite long enough and left me with no foot room. 7G in the middle pair was significantly better. I have not seen this in other comments. My husband and I recently flew from Frankfurt to Chicago on this plane. We are short(both under 5'6 and 5'2") and small stature. I sat in G and my husband across the aisle in seat H. The foot room was poor to say the least. I had only a small backpack and no purse. I could only put the backpack sideways under the seat ahead of me and barely fit my feet aside of it. When the person in the seat in front of me insisted on reclining her seat fully for the majority of the 9 hours I barely had any personal space. My husband had a similar experience. On the way over on the same plane I sat in the middle seat next to him on the side aisle. Believe it or not I had more leg room there. The attendents do a nice job of serving meals and making water available the entire trip. The seats were typical airline seats for comfort which translates to not good on that long of a trip. At this point I would only consider upgrading for more legroom to fly on this plane again. I have to say this was the worst experience flying business that l have had, it took a hour from leaving the lounge to boarding the plane, no bridge so we had to go by bus then wait forever to board, the seats are narrow and hard and something not much larger than a shoe box to put your fleet when sleeping, my return is premier economy, so lets hope its better for the price. I would choose Lufthansa again over British business. The best thing about these seats is they are great for flying with a companion. Wifi was great, and the TV screens are nicely shielded so you don't see much from others' screens. However, your screen is not directly forward of your gaze, which is slightly annoying. Programming is limited. Sleeping was OK. Elbow space is cramped, there is no knee support, and the blanket is too thin. The mini cabin was also chatty on my flight beginning 2 hours from landing. Food was uninspired. The lavatories are not bothersome as the entry is rear facing with a corridor to hide the people and door so people do not congregate next to you. The recline is not restricted from what I could tell. Spent a good time on board flying to Boston from Frankfurt. Lots of space to put al your cabin bags. Feels almost like a second table, perfect for a small notebook or anything else while using the try table for lunch. I just don't like that your feet are coming near your neighbors when you lie flat. Although there is a partition wall, I felt a bit uncomfortable. One of the best seats in the air for business travel. Smaller, quiet cabin on upper deck, less chaos than downstairs. Seat is comfortable and window seat (as on all 747s)provide great combo of view and huge storage bins to keep carry-on stuff accessible all the time - taxi,takeoff, landing, etc. Perfect for two travelers, as access to aisle still tricky if aisle passenger asleep and not related! I´m 1.86m tall. Still one of my favorite seat in a Jumbo. But if you get the chance to book 46B this could be the better one, because with a bit of luck, the person on 45B put nothing in the free space between the seat and the aircraft, so you can stretch your legs thru this space in 45. After all, it´s Eco and still better than any US-Carrier i´ve ever flew on intercontinatel flights. My wife and I had seats 20j and 20K from FRA-ORD. I found the seats to be quite uncomfortable. We did not mind being close to the lavatories since these seats are between the business class and economy premium seats. We had plenty of incline for the seat. I just felt sorry for the lady next to me because I am 6'1 225 and I took up some of her space with my shoulders. I would of hate to have 3 people 200+ in 1 row. Good leg space, though cramped near the feet. Fellow next to me kept kicking the small plexi divider which kept pushing into me. Luggage space is limited due to sitting on "bubble" but also a much quieter flight due to less activity. The USB slot is less than intuitive but the multiple seat options assure you will find an angle that works for you. Seats 32D, 32E, 32F and 32G have limited recline. This seat is business class upper deck near the window. Big comment is that although it is a flatbed seat anyone over 185cm will have to sleep sideways and fold your legs, bumping into the passenger on your right. I am 196 and I just didn`t fit. I looked around and mostly saw people stuck in as a cocoon to their flatbeds. Maybe 84A is shorter in length because instead of a seat in front it has a panel. Also we never got the amenity kit. And if you have to leave the seat and the person next to you is sleeping it is quite an exercise to get over without falling. Service was impeccable and food was great ... but to me the most important is comfort and space and I didn`t have the space to lie flat. Nothing wrong with seats 47H and 47J. Recline was fine. We didn't have to worry about reclining too far back into someone's lap! Premium Economy Class is the waiting area for the dedicated toilets which also serve the Economy Class - never again! The first row in premium economy on the window sides is great. The only downside is that economy and premium economy are not separated by a wall or a curtain, so everybody uses the dedicated toilets. 16 A and C, as well 16 H and K are good seats in the economy cabin...especially the aisle seats with plenty of legroom and storage behind the last business class row. The curtain is a little close, but on a night flight I did not care as the legroom was great. Very good seat. I am only 5'8" but there was enough room for me to fully extend my legs. I feel having the tv and tray table in the arm rest is better because you have more flexibility. Definitely recommend this seat. I fly with Lufthansa from Athens Greece to Chicago and back. 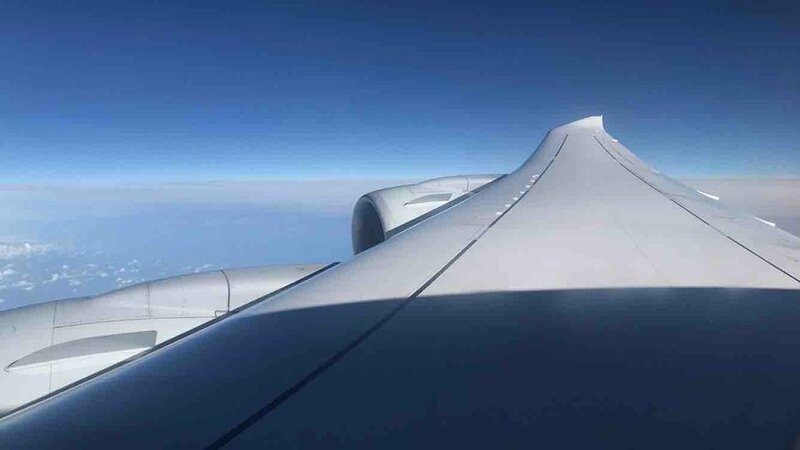 I am very happy when I fly with the Airbus but Today I flew with the Boeing 747-8i and the seats are very small and uncomfortable I will not fly with the Boeing again. This is a wonderful plane with amazing seats! The row 84 is not a good row to sit in. Why? The flight attendants deposit their bottles and service stuff right in front of you on the wall. (due to their so called signature service) During the service you have constant traffic and work right in front of you, very disturbing. Secondly it gets really cold after a while because of the doors right in front of you. I would rate it the least comfortable seat row on the upper deck. Both rows are inside the Economy compartment air-conditioning zone. Hence the airflow is much louder than in rows 4-9. I sat in seat 11H and compared the two zones. Lufthansa has the 2nd best PE in the world. The 1st one is Air New Zealand on the B787-9. Anyways, nothing to complain. The seats, legroom and comfort are the same found on the very beggining of the Business classes in the 80's on DC-10 and B747-200 aircrafts.My flight was on a B747-8 and row 22 is very close to the toilets, be aware. It is also a little bit strange the arrangement Economy/Premium Economy/Economy, as you can see in the seatmap. Lufthansa, please improve the gadgets of your PE class at the airport, like a pre-boarding and separate check-in for example... AF does. Absolutely terrible economy class in LH's B748! Very narrow cramped uncomfortable seats (whereas 747's cabin width allow seat width of 18"! ), IFE power box under the seat, very bad ergonomics - IFE remote control mounted in the headrest making it inconvenient to use, USB port is located under the headrest which is also inconvenient. All these factors make this B748 unapplicable for long-haul flights. AVOID flying economy class on this plane! It's a HUGE SHAME for one of the Star Alliance founders! Food was the only positive thing. It's a way below Qatar's, Emirates and Turkish's food, but eadable and quite tasty. All the uneven rows in the middle cabin of economy have 2 windows. It's common practice to LH to start terrible STRIKES every year on the Thanksgiving Day. The period between about 7 days before and 7 days after Thanksgiving must be blackout for flying LH. AVOID AT ALL COST FLYING LUFTHANSA WITHIN THESE DATES!!! The business class seat was very comfortable and the amenity kit was alright. As my seat was against the wall, I had a lot more storage than the other business class seats which was good as I don't like putting things in the over head compartment. The only bad thing about this seat was that to get the table out, you had to move all your little thing to the side in order to open the compartment to which were you can get the table out. The noise cancelling head phones were good quality, the food was very good, and the overall experience was quite good. The 747-8 is really nice. As for the "footsie" seats, I didn't find it a problem but I am not sure my seatmate ever reclined. Lufthansa food and service was good as always! Despite more legroom and seat width limited by embedded tray table and PTV, there was no window on this seat. It was covered by a wall, so there is no usual space to lean on, like other regular window seats. Have flown it FRA-MEX. Seat was ok, however all seats A and K (at the window) have a box underneath for the entertainment system. Makes it a bit bad for the feet on a 12hrs flight. Tabe is almost not usable due to not enough space, but thats the fact in most eco classes. Be creative when food and drinks are served! Food and crew were great for what you can wish for in eco. IAD-FRA. I'm 6'6" and weight 265. Legroom was great for a non-bulk-head/exit row seat even when 22H reclined her seat all the way. I was surprise how far the row in front reclined; far enough that the screen on my 15" Macbook Pro would have been damaged had I not seen it coming. Too, when the pax in front of you recline their seats all the way, it makes exiting your seat quiet difficult without pulling on the seat in front. But then again, when the person in front of me is 5'6" and doesn't look behind them before pushing back to full recline, my consideration for the row in front of me lessens somewhat. Def. worth the extra $ for leg room ... I just figure it as one of the costs of being a tall person. Good seat! Due to the body of the aircraft that becomes narrower in this part there is no seat directly at the window. So there's a lot of space beneath the window for bags and enough room for your feet beneath the seat in front of you! The seats 25D to 25G which is the last row of PE are each about an inch narrower than the rest of the PE seats. This is to facilitate the transition to the economy seats. It makes a big difference. THE "NEW THIN DESIGN" SEAT IN ECON SECTION ARE VERY UNCOMFORTABLE, NARROW AND HARD. USING THE TABLE/TRAY IS NEAR IMPOSSIBLE DUE TO SPACE BETWEEN SEATS, SO ALWAYS TILTED UPWARDS. NORMALLY FLY THE NEW PREMIUM ECON WHICH ARE MUCH BETTER EXCEPT THAT PROXIMITY TO TOILETS MEANS FLUSHING TOILETS FOR ENTIRE FLIGHT AND PASSENGERS WAITING TO USE THEM-FEELING OF SITTING IN A CROWD. OVERHEAD BINS ARE HUGE. Absolutely awful seats in economy on Lufthansa 747-8 from Frankfurt to Dulles. Seat was one of the newly 'designed' seats to maximize room through reduction of seat width, resulting in absolutely no ergonomic support to lower back. Had to stand up for 3.5 hrs. of 7.5 hr. flight due to lower back pain, which I don't normally experience on conventional seats. Crew and food were great, but the seat made the flight unbearable. Row 27 in this configuration is the first row of normal Economy class immediately behind the Premium Economy section. One thing to note - this is NOT a bulkhead seat, as there is no bulkhead. There is only a partial semi-transparent "screen" hanging way above the last row of PE seats, Other than that there is no physical partition between PE and normal economy. This means that you get loads of leg room there. Actually way more than PE passengers have! At the same time, as it is not a bulkhead or emergency row seat, there are no limitations in stowage of your personal items for takeoff and landing. Personal viewscreens and tables are in the armrest, but this did not make the seat too narrow for me (and I'm not exactly thin at 175 cm and 100 kg). Notable feature is that in the last row of PE seats, i.e. row 25, A, D, G & K seats have monitors in the back too. The monitors have very limited functionality, so for personal entertainment you still need to use your armrest device, howver those backseat screens have working USB charging ports, which are more convenient to use than the armrest ones. The only drawback of the row 27 seats is that remote control for personal entertainment is at the inner side of an armrest, which may lead to you pressing buttons accidentally. All in all these are probably the best Economy Class seats on this plane. Has two AV boxes under seat in front so limited legroom. No A seat so extra room between seat and window to place things. Too far from wall to sleep against. Has AV box under seat in front so limited legroom. Wonderful aircraft, food and entertainment. My flights were both ways from ord to fra. FRA-EWR seat 85H, upper deck. Why LH chose the two-seat side-by-side arrangement in business class is beyond me. They should have joined their Star Alliance partners and gone for single seats when they upgraded business class a few years ago. In the middle rows on the A330, A340 and A380 as well as on the upper deck on the B747-8 they've even chosen to angle the foot end of the two-seater in towards each other so both share a rather narrow space with a flimsy divider in between. This is due to space restrictions. That said, the seats themselves are very comfortable and the service impeccable. The problem is of course that your co-traveller in the window seat has to climb over your legs when you're sleeping which can easily disturb you. In the outermost (window) rows of these aircrafts the seats are aligned parallell to each other. Another peculiarity in the LH seat is that apart from the seat control itself, all other functions such as light, attendant call etc. are hidden under the foldable armrest. That means you have to get rid of whatever glasses, books etc. you've placed next to you in order to open the lid and press the buttons. Strange. On the plus side, the seat is, as mentioned, very confortable. I'm 195/6'5 and slept very well indeed. As for the B747-8 itself, it's a bit more noisy than expected, especially as speed picks up you notice an increase in the airflow induced noise. This might be better downstairs, I don't know. Perhaps the grand old lady is starting to show her 1960's basic design, but compared to the A380 and even quieter A340-600 it's a marked difference for the worse. Given a choise I would take the A340-600 any day. Seats themselves were comfortable and the adjustable headrest was very nice indeed! knee room was good thanks to the newly designed Lufthansa economy seats. However, there are a couple of problems. Avoid E seats were possible! The entertainment box for the screens, as well as a mounting point for the seats in front are directly where your feet should be, so you have to attempt to share with the person sitting next to you. Not good! Also, the selection of entertainment was good, but the 'standard' entertainment screen were quite slow and you really had to push hard into the screen for it to respond. The new screens on the old 747-400 however fixes this. They are higher resolution and extremely fast and responsive! This seat although being in Premium Economy is subject to bumping and being pulled by the passengers behind. This appears to be because of the increased recline of the seat and in this position it closes the available space for the economy seats behind. It was comfortable here but these seats 25 A,C,,D,E,F,G,H and K would all be susceptible to this as only a Half length curtain is departing the zones. I was in seat 11D, center seat in the last row of business class in the lower cabin, on a flight from Newark to Frankfurt. The benefits of the seat were the extra wide console between seats in the center aisle, the ease of getting out and not having to move for the person next to me to get out (since they also had aisle access). I was not bothered at all by the economy seat passengers behind me. I found the flat seat to be very comfortable, the service to be quite good, and the overall experience to be exceptional. In addition access to the business class lounges offered by Lufthansa were a nice addition, in particular in Frankfurt which offered shower rooms and was quite roomy (Newark's was rather cramped and oddly shaped). Great legroom, but the reduced width of the seat made it very, very uncomfortable. Almost would rather have been in a normal seat! Flight from Buenos Aires to Frankfurt and return in the new Premium Economy class (13 hours' flight!). Very comfortable seat, lots of legroom including footrest at the back of the seat in front, extended recline, wider seat than Eco, wide armrest in-between the neighboring seat, which makes you feel not cramped at all, good separation with the passenger next to you, wider VOD screen. A bottle of water in every seat and a welcome orange juice. Food and drinks seem to be the same as for Eco class, anyway they are usual LH high standards, All in all an excellent experience (and I had the chance to pay a little bit less than the normal Eco class!!) Highly recommended!. Position should be good. Not the first row, aisle, no toilets or galleys... But, there is at least one very annoying problem: feet-room. Entertainment-Box AND arm-table (from front-seat) AND Life-jacket reduce feet-room up to a incredible small space, where just one of my feet will fit! NO GO!!! Folding tables are very cheap crap. They fold twice, and none of them get to be a flat surface. They don't have any borders to avoid sliding of contents, so you keep all time worried on avoiding to through things down. Seats are very skinny on their thickness, so there is more room for long legs, even if front-seat lays back. Thou, Seats aren't obviously very comfortable, since fewer stuffing. In overall, legroom, is ok. Seats have a chronicle problem to get back to vertical position. I think most of them need help from board personal. Quite odd problem. Lufthansa, have you economized TOO MUCH in your furniture?! Extra elbow room between seat and window, enough to put my backpack next to me. That is good, as the area under the seats is broken apart badly through poor design on the the seats. My backpack was a tighter fit down there than on most reginal jets. In these pairs of two seats, the main IFE box is outside the support leg and right where your right foot wants to go. You get to choose to have it tight on the left with your other foot and the passenger next to you, or put it in the open space between the wall and 46J. Although this is a back-row, it does not have the wall behind it, rather there are oxygen tanks and the emergency door. Thus, the seat reclines as much as any other in coach. There is a gap there where people congregate for the lav, but it is not bad because there is so much space. The USB and Ethernet ports under the arm seem to be disabled. The IFE headphone jack is that old two mono-jack affair. If you want to use your own headphones, bring that silly adapter. I do not think that escaping out side is allowed, at least when observed. The gap between the wall and the top of the armrest is ~5" at the back and ~8" at the front. I might go for 46J or 45J next time, which have much more space. Also, note that there is a small IFE box under the seat in front of 47H. 27D on this version of the 747-8 is a great seat. In fact the entire middle section of 27 is great, ample extra legroom. Well worth the $100 upgrade. There is no bulkhead as stated. Also sat in 25D for an in flight upgrade to Premium Economy. Have to say if I booked on LH again I would fly PE all the way. Comfier, wider seats with more recline plus a footrest. Loved the 747-8...what a plane. 16A is a good seat. It offers extra legroom and no noise and no passing people. it is easy to get out from the seat even when people sit beside you. Good overhead luggage compartment share with business class. Seats 10c and 10 h are the worst business class seats on a 747-8 v3. They are not standard seats because they have been forced into a smaller angular space as the aisle changes direction to go into the alley area. These aisle only have approximately 75% of the console space that the window seats have in front of the seat. There is no panel or storage area to the left of the video screen and no coat hook. If one puts one's legs straight ahead they block the aisle. Seats 10 d and 10 g take up maybe 40 % more space and the bulkhead console is maybe 1.5 times wider than that in front of the two seats on either side. This is very poor design. Also you should look at the bulk head seats in the front row of business on this aircraft where there is no console and very limited storage space. I enjoyed the Premium Economy class for the first time. Seats 23A and C were nice as they were close to the front, but not too close. I did no sit in row 27 but I noticed that this front row of the economy section has a HUGE amount of legroom. I don't know how much the alternate tray may have diminished width, but I thought these people really hit the jackpot getting that much legroom for no surcharge. Seats C and H in that row did project into the aisle which may be a bit bothersome for some, but due to the extra room in Premium Economy in front, it didn't seem to be a big problem. The new premium economy seats are very good, I am over 6ft and they were very comfortable for a 12 hour flight. The Entertainment system is also very good. However, as others have said the cabin arrangement is very odd with economy seats in front and behind the premium economy section. This means that the service is no different to that in economy with the same food. Overall a bit disappointing - there needs to be a greater differentiation between economy and premium economy to justify the additional cost. Also quite a bit of noise and queues for the toilets. 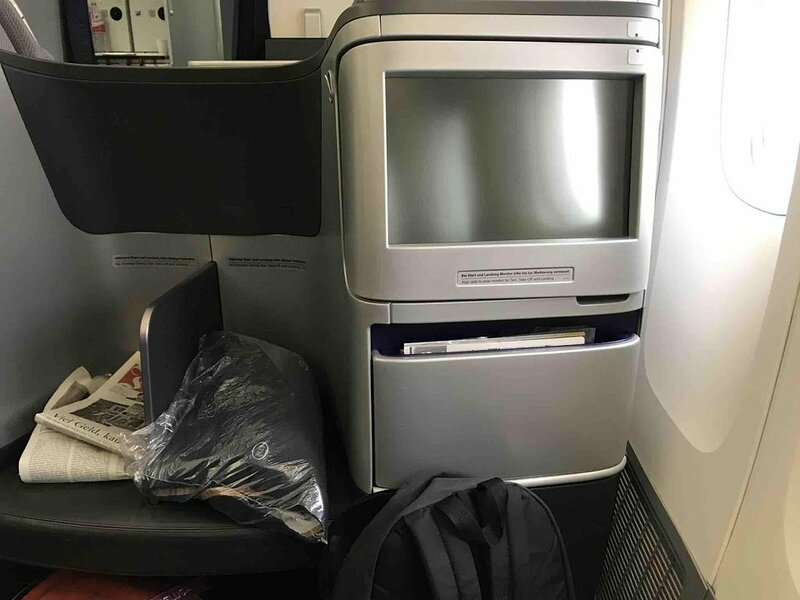 Flew to JFK on April 17 from FRA with party of three, service and food just average, excellent IFE, never got bored, we were seated in the little compartment just behind Business class, kind of cozy. The seat was comfortable, a bit wider as Economy and much more leg room which makes the journey comfortable. The only discomfort, compared to others, are the harder seats, whilst the lower back support didn't match with my back, too high located. The service is better as in Economy, comes close to the Business Class. At Buenos Aires we had to board together with Economy Class based on row number i.e. we were the last to board. It would be an improvement if we could board after the Business Class, which gives your trip a bit more cachet. Just finished my 1st flight in LH's Premium Economy on my return from FRA to HKG. Compare to other airlines I am using frequently on this routing, the major con is the missing curtain, separating PE from Y-class and lavatories. It is always noise due to people on there way to/from the lavatories. 22K FRA to GRU. Lots of legroom (technically an emergency exit row) and curiously no cold air from the exit. Con´s: heavy traffic of lavatory goers from standard coach plus no dividing curtains - pax thus have direct views of the toilet bowl every single time a lav door is opened plus disturbing light from the lavatory. Applies to all four seats 22ACHK. Tried LH Prem Econ seats for FRA-ORD as an alternative to business (I don't really like to sleep westbound, induces jet lag). Overall a nice improvement over plain coach. Service is the same as LH coach, which is to say compitent and polite. Pros: * Plenty of legroom * Seems to have more seat width than Econ * More recline * Fewer people per row = more overhead bin space per person * Board plane via Business / First lane (irrelevant if you are Star Alliance Gold or higher) Cons: * Unless you have the isle seat, its very hard to get in/out of the row because of the seat recline * IFE system had some gremlins, reset twice * Window seats have a seat support bracket that interferes with foot placement and kind of reduces width under the seat. * Headrests are awful. Several broke on the flight. * Footrests only work for short people (Dear LH: Some of us are over 5' 8") Meh: * Odd cabin sequence on this version of the 747-8: First, Biz, Econ, Prem Econ, Econ. Not sure why they put more econ seats inbetween the Biz and PE sections. * # of lavs seems to be just ok, sometimes a bit of a wait. * No lounge access unless you are *Gold or better, or pay extra. Overall, I would recommend spending a few extra dollars/euros for these seats. It compares favorably to UA and DL "econ plus", which is just more pitch but the same width. Good job LH. Lufthansa flies 1 versions of Boeing 747-8.